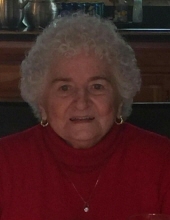 Bernadette M. “Bernie” Ginkiewicz, 87, of Frederick died Thursday, November 8, 2018 at Seasons Hospice at Phoenixville Hospital. Born in Manayunk, she was the daughter of the late Julian and Anna M. Halicka Bielawski and the wife of the late Raymond J. Ginkiewicz with whom she shared 59 years of marriage before his death in September 2009. Bernie was a member of St. Phillip Neri in Pennsburg and Lafayette Hill. She was President of the St. Phillip Women’s Guild, and bowling league for over 50 years and a member of the Philippians; she also enjoyed playing Bingo. Bernie and her husband loved to travel. Bernie is survived by her three daughters: Ramonde Ginkiewicz of Greenville, Deborah Kenna and her husband Douglas of Perkiomenville, and Madelyn McGuckin and her husband Benjamin of Frederick; 12 grandchildren, 7 great-grandchildren; and her two sisters: Matilda A. Greer and Sister Lourdine Bielawski, OSF. In addition to her parents and husband, she was predeceased by her siblings: Chester, Edward, Francis, Ramalda, and Henry. Bernie’s funeral mass will be celebrated Thursday, November 15, 2018 at 12pm at St. Phillip Neri, Lafayette Hill. Visitation will begin at 11am. Memorials in Bernie’s honor may be made to St. Phillip Neri 437 Ridge Pike, Lafayette Hill, PA 19444 or to Kidney Cancer Association 9450 SW Gemini Drive #38269, Beaverton, Oregon 97008-7105. To send flowers or a remembrance gift to the family of Bernadette M. Ginkiewicz, please visit our Tribute Store. "Email Address" would like to share the life celebration of Bernadette M. Ginkiewicz. Click on the "link" to go to share a favorite memory or leave a condolence message for the family.